Whether it's GLO UNLIMITED FREE BROWSING or ETISALAT 60MB FREE BROWSING, Stark VPN is fully behind you and I will give you the steps by step guide on how to setup Stark VPN for free browsing on your Android devices. Talking about Glo cheat, it is no more a new stuff as Glo refuses to block it even after it's gone viral almost everywhere. Maybe because of their poor 3g network in most areas. I can't just tell but everything is working for the benefit of someone like you that enjoys surfing and downloading stuffs free of charge. Like I said earlier, the glo browsing cheat is unlimited and if you are fortunate enough to have decent Glo 3G network in your location, my dear you are on top of the world because it's free browsing 24/7. So why not grab this opportunity to enjoy awoof. Meanwhile, Etisalat 60mb cheat is still blazing but its limitation is the data limit of just 60MB for a day. It might be the reason Etisalat ignored or haven't noticed it but be it as it may, 60mb is still better than non. It can help you read stuffs online, chat with your friends on WhatsApp, Messenger, BBM etc. So it's another alternative free browsing solution and I will be recalling your mind on how to use them with one of the easiest and simplest free Internet browsing app known as Stark VPN. I had already written article that compares the features and differences between Stark VPN and Tweakware VPN so you can read the article and see if Stark VPN is better than tweakware or the other way round. Having said that, allow me to tell you that Stark has one if the most beautiful user interface and easy to use. It works almost the same way with tweakware as the cheats on the app are already pre-configured so no need to stress yourself for inputting proxy servers, IPs etc like in Psiphon. Little wonder it is one of the best free browsing apps 2017. After configuring the APN, launch the Stark VPN application and use the below settings. ✔ In the first box, select any Region of your choice. 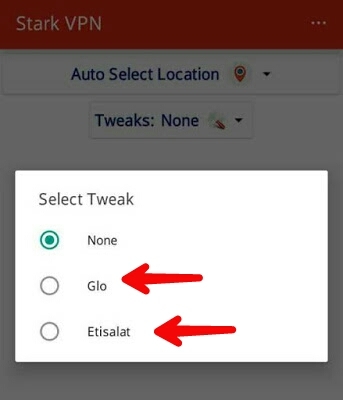 ✔ In the second box called Tweaks, select "Glo". ✔ Now, tap the "RED" button, and wait for the VPN to connect. It will connect within 10 seconds. That's all. Launch your browser and start browsing. If you are fortunate to have better globacom 3g network. You are blessed. 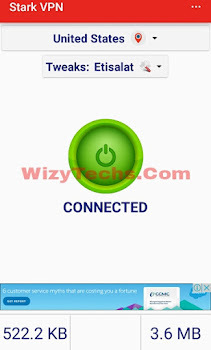 Use the default Etisalat APN settings. ✔ In the second box called "Tweaks", select "Etisalat". ✔ Now, tap the RED button, and wait for the VPN to connect. It will connect within 10seconds. Etisalat free browsing is very fast but just 60mb usable per day. I think it should be fine for students unless you are downloading large stuffs or updating your apps, that's when it will be too little for you. Continue enjoying these cheats while it lasts as it seems that both Globacom and Etisalat is aware but decided to leave it. Enjoy! Are you still confused on how to browse free with your phone using the above steps? Just drop your questions via the comments box and I will attend to you. Remember to hit the SHARE buttons to share this post with your friends on social media. More free browsing cheats coming soon. Keep checking back or better still, bookmark this blog for future reference. Happy browsing!!! Your proxy server is probably down. tankz oga wizy.. .. Glo is blasting. ..
@wizy I think it's d Web proxy that are weak, I av tried buka, german etc.. Pls help me look into it, I need download a file, thanks..
nice one but glo is sumtin else hia..
have 3g whr i am currently bt it isnt even attempting to connect any ideas y? Pls hw can I root mine Lenovo A536? oga wizy....pls is dat glo apn settings or we r to use normal glo default settings? Sorry about that, Etisalat 0.00kb cheat is currently misbehaving. But keep calm! Am working on it and it will be fixed soon.